(Bloomberg) -- Smith & Nephew Plc dropped on a report that the medical-device manufacturer is in talks with NuVasive Inc. about a deal worth more than $3 billion to gain spinal surgery products. The stock fell as much as 5.5 percent in London Monday. NuVasive share rose 11 percent to $54.85 at 9:57 a.m. in New York, after a report Friday in the Financial Times on the possible interest from the U.K. company. Smith & Nephew recently signaled its readiness to pursue a bigger deal, with Chief Executive Officer Namal Nawana saying last week the company wants to play in more areas of medical devices. The market questioned the rationale of buying NuVasive, however. The U.S. company’s revenue growth has been slowing, and a robot for spinal implants it’s racing to introduce this year faces competition from Medtronic Plc and Zimmer Biomet Holdings Inc. Adding NuVasive “does not offer a strong strategic rationale,” Michael Jungling, a London-based analyst with Morgan Stanley & Co., wrote in a note on Monday, saying the U.S. company would give Smith & Nephew only a second-tier position in the spine market. The U.K. device maker could have $3 billion to $5 billion of acquisition power, Jungling calculated. Dealmaking is heating up in the orthopedics and medical-technology industry as companies hunt for innovative products to boost growth. Medtronic last month completed the $1.7 billion acquisition of an Israeli company whose robotics-assisted products aid in spine and brain surgeries. Two years ago, Zimmer Biomet spent $1 billion to buy spine-implant maker LDR Holding Corp.
More tempting for Smith & Nephew could be Globus Medical Inc., which also makes spine products, or Wright Medical Group NV, according to Jason McGorman and Holly Tyler, analysts at Bloomberg Intelligence. Both the potential acquirer and target are undergoing management changes. Smith & Nephew’s Nawana took over last year and has been tasked with reigniting earnings. Nawana has a background in NuVasive’s market, thanks to almost two years as president of a Johnson & Johnson spine unit. NuVasive, meanwhile, picked a former Medtronic executive, Christopher Barry, as CEO in October. NuVasive’s sales grew about 5 percent last year on an organic basis to about $1.1 billion, the company said on Jan. 7. The company’s flagship product is XLIF, a minimally invasive spinal surgery technology that’s been in use for more than a decade. 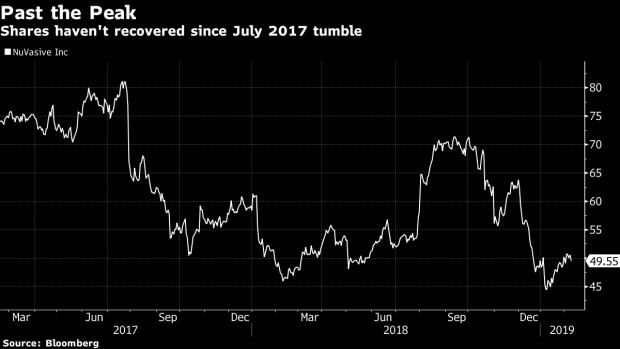 The shares have fallen by about a third since reaching a peak of $81.11 in July 2017, when NuVasive said it would scale back global operations as its chief operating officer and chief financial officer stepped down. The U.S. Department of Health and Human Services had subpoenaed the company a month earlier, seeking documents related to a customer account. NuVasive has said it’s cooperating with the request. --With assistance from Joshua Fineman.